President Trump rarely spoke about the Federal Communications Commission during his campaign or after entering the White House. But since Trump took office and appointed a new head of the FCC, the agency has quickly set off a wave of outrage. On Thursday, the FCC voted 2-1 to move forward with a proposal to roll back net neutrality protections. The rules were put in place by the FCC during the Obama administration to keep the Internet open and fair. Dozens protested outside the FCC headquarters in Washington, D.C. as the vote got underway. More than one million comments were filed with the FCC ahead of the vote, thanks in part to a rallying cry from "Last Week Tonight" host John Oliver. Ajit Pai, the FCC chairman appointed by Trump, has also come under fire for taking steps to allow greater media consolidation, "reducing" Internet access for low-income households and giving his blessing to Congress to repeal Internet privacy protections. 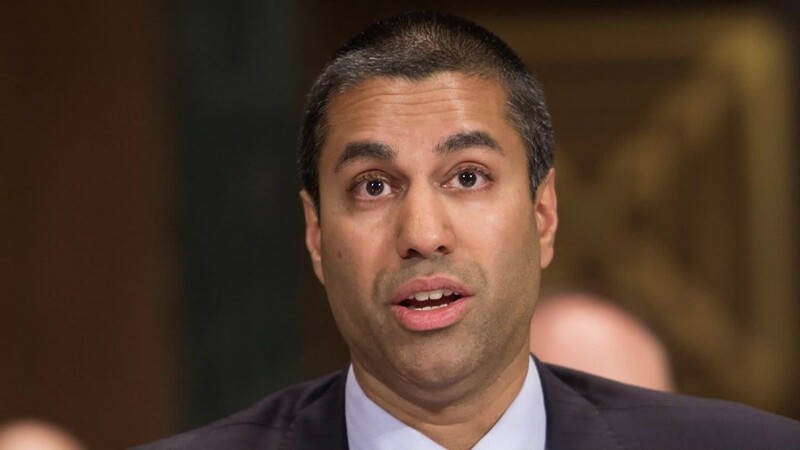 In remarks delivered earlier this month, Pai said his priorities included "eliminating unnecessary regulatory burdens" and "promoting innovation across the communications industry." But critics see a different guiding force for Pai, a former lawyer for Verizon (VZ) who has been an FCC commissioner since 2012. "Every single thing they're doing is for incumbent telephone cable and media companies," says Gigi Sohn, a counselor to former FCC chairman Tom Wheeler. "Pai wants to make the big bigger and the rich richer." The net neutrality rules, approved by the FCC in 2015, prevented Internet service providers from deliberately speeding up or slowing down traffic from specific websites. Without the protections, ISPs would have more leverage to potentially undercut a rival video service on data costs or load time. That could be good for consumers at first, but opponents argue it will be harder for any startup looking to become the next Netflix (NFLX). Under Pai, the FCC has also shelved a plan to eliminate the need for pricey set-top box rentals from cable companies. The plan had been vehemently opposed by the cable industry. And Pai applauded Trump and Congress for repealing FCC Internet privacy protections that would have given consumers an extra safeguard online. "There are now no rules governing what ISPs can do with your data, and that's something this FCC has endorsed," says Kevin Werbach, an associate professor of legal studies at Wharton and former FCC adviser. The FCC has also begun to upend the media landscape. Last month, the FCC voted to reinstate the "UHF discount," which allows broadcasters to understate the reach of their stations. Opponents argued the move would pave the way for greater consolidation of broadcasters. Less than three weeks later, Sinclair Broadcast Group announced plans to acquire Tribune Media in a deal that would push the total TV stations it owns above 200 nationwide. For those upset by these moves, it's worth remembering how much worse people thought it could be. After the election, there were concerns Trump would turn the FCC into a blunt instrument to "rein in" unfavorable media companies, according to Werbach. So far, that has not happened. Pai set off some alarms by not explicitly rebutting Trump's claim that the media is the enemy. There was also an overreaction after Pai confirmed the FCC was conducting a routine review of Stephen Colbert's Trump jokes. "Ajit Pai very well may have been the FCC chairman under any Republican administration this year," Werbach says. "He was nominated by Trump, but he's not a Trump guy per se." On at least one occasion, Pai's FCC has actually taken a step that even Trump's most ardent critics would welcome: voting to crack down on robocalls. If there's one thing that the entire country can still agree on, it's probably that.